THINK moves it on a little further down the line with its Johnny Cash Limited Edition. The bold ebony Italian resin pays homage to the iconic Man in Black. Striped, wood-grained accents, inspired by detailing from his guitar, enhance the barrel. The clip resembles the guitar*s fret board inlay. Johnny Cash*s signature highlights the band. Each pen comes in a black lacquer Johnny Cash box. Accents are silver vermeil. The fountain pen is enhanced with a medium width stainless steel nib, cartridge/converter fill. 888 Rollerballs were originally available worldwide with only a small number now remaining. THINK about your heart racing when you are alone in the dark. THINK about your terror when you know you are not alone. THINK takes a stab at rekindling your horror movie fears with its Limited Edition writing instrument, Friday the 13th(tm). The barrel�s midnight black Italian resin is dripping in blood red lacquer. The clip is a gruesome reminder of Jason�s bloody machete. Each pen comes in a pitch-black Friday the 13th(tm) box with Jason�s infamous hockey mask. instrument. It�s in the hole!!! It�s in the hole!!! Accents are silver vermeil. Limited Edition of 888 Rollerballs. The THINK Andre the Giant Limited Edition Rollerball embodies the famous size and stature of a man who was legendary for his achievements in and out of the ring. This large pen measures 8 � inches in length, closed, and is a rich royal blue Italian resin. The Accents are bronze and only 888 pens produced worldwide. THINK about the 60*s, THINK about the music. THINK about the way it makes you feel�THINK Hippie. 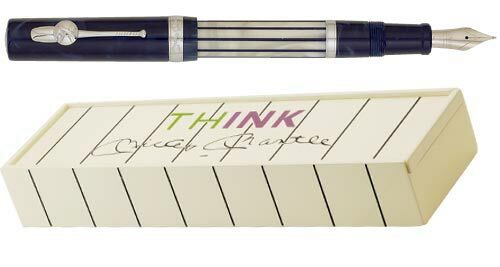 THINK captures one groovy era with its Limited Edition writing instrument. The unique Hemp-colored matte Italian resin pays homage to this subculture. The clip is a distinctive Cannabis leaf design. The phrase *Absof*ckinlutely* highlighted on the matte silver band was a sign of the times.Accents are silver vermeil. Limited Edition 888 Fountain Pens (Medium nib only) and 888 Rollerballs. The latest Limited Edition from THINK is a tribute to legendary film icon, John Wayne. John Wayne starred in over 140 feature films and was regarded as a symbol of *Old West Americana*. The fine resin barrel is made up of alternating bands in a palette of Western colors of sand, dark brown, red, rust and orange. The clip is modeled after the River Waves of the Red River D brand (from the 1948 film *Red River*). Monument Valley buttes rise atop the band which features John Wayne�s signature. Each pen comes in a luxuriously lacquered John Wayne box. The fountain pen is enhanced with a medium width stainless steel nib, cartridge/converter fill. 888 Fountain Pens and 888 Rollerballs are available worldwide. JOHN WAYNE, DUKE and THE DUKE are the exclusive trademarks of, and the John Wayne name, image, likeness and voice, and all other related indicia are the intellectual property of John Wayne Enterprises, LLC. All rights reserved. www.johnwayne.com . THINK moves it on a little further down the line with its Johnny Cash Limited Edition. The bold ebony Italian resin pays homage to the iconic Man in Black. Striped, wood-grained accents, inspired by detailing from his guitar, enhance the barrel. The clip resembles the guitar*s fret board inlay. Johnny Cash*s signature highlights the band. Each pen comes in a black lacquer Johnny Cash box. Accents are silver vermeil. The fountain pen is enhanced with a medium width stainless steel nib, cartridge/converter fill. 888 Fountain Pens and 888 Rollerballs are available worldwide. Bruce Lee Limited Edition Rollerball - Write words from a master with The THINK Bruce Lee Limited Edition writing instrument. Bruce Lee, known worldwide as THE master of Martial Arts, is regarded as the father of modern day martial arts, martial arts cinema and the inventor of Jeet Kune Do. His philosophy transcended the world of martial arts. Each pen features a power red cap adorned with a golden dragon clip. The trademark Bruce Lee symbol atop the pen counter-balances the golden band with raised Bruce Lee lettering. Available in a Limited Edition of 888 Fountain Pens (Medium, steel nib only �cartridge/converter fill) and 888 Rollerballs. Bruce Lee Limited Edition Fountain Pen - Write words from a master with The THINK Bruce Lee Limited Edition writing instrument. Bruce Lee, known worldwide as THE master of Martial Arts, is regarded as the father of modern day martial arts, martial arts cinema and the inventor of Jeet Kune Do. His philosophy transcended the world of martial arts. Each pen features a power red cap adorned with a golden dragon clip. The trademark Bruce Lee symbol atop the pen counter-balances the golden band with raised Bruce Lee lettering. Available in a Limited Edition of 888 Fountain Pens (Medium, steel nib only � cartridge/converter fill) and 888 Rollerballs. -from Oh, the Thinks You Can Think! 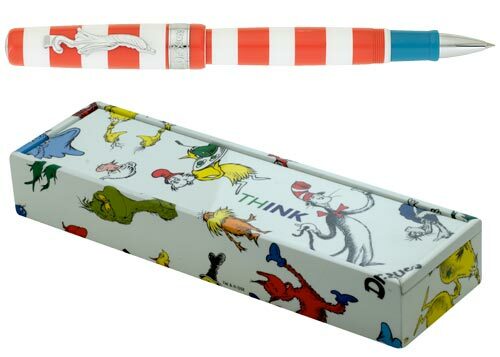 The Dr. Seuss Limited Edition writing instrument. �Dr. Seuss� word mark highlights the band. This pen is anything but ordinary. Available in a Limited Edition of 888 1/2 Fountain Pens (medium width, steel nib only-cartridge/converter) and 888 1/2 Rollerballs. Accents are silver vermeil. 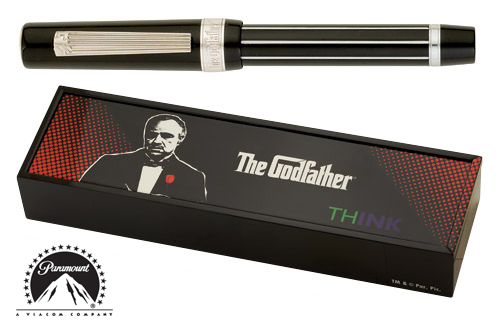 Become part of the family with The Godfather THINK Limited Edition writing instrument. Each pen pays its respects to one of the most influential and ubiquitous films of American Cinema. The Godfather included an all-star cast and an epic story that culminated in one of the most popular dramatic experiences in the history of film. Each beautifully crafted black Italian resin barrel dons a silver pinstripe along with a red grip section. The clip features the iconic puppet hand logo of the film series. The Godfather word mark highlights the band. 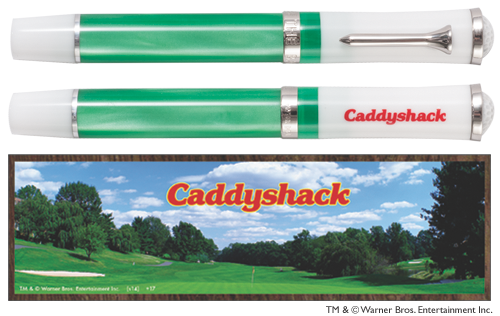 This pen is one offer you can�t refuse. Available in a Limited Edition of 888 Fountain Pens (medium width steel nib only - cartridge/converter fill) and 888 Rollerballs. Accents are silver vermeil. TM & � Paramount Pictures. All Right Reserved. The Mickey Mantle THINK Limited Edition pen honors one of the most beloved ballplayers of all time. He is considered by many the most popular player in the history of baseball and the best teammate that anyone ever had. He was bigger than life and the true idol of all baseball fans. The pen is artisan made using custom Italian resins. The cap and blind cap are rich swirls of vintage New York Yankees� navy. The barrel is made from luminescent ivory resin with navy pinstripes. A three dimensional bat adorned with Mantle�s 7 comprise the clip. Mickey Mantle�s signature highlights the band. Accents are silver vermeil in the Limited Edition of 777 Fountain Pens (Medium, gold-plated nib only) and 777 Rollerballs. Cartridge-converter fill. Also available are 77 Fountain Pens and 77 Rollerballs with all pen accents in gold vermeil with the fountain pen nib in 18kt. Gold, cartridge/converter fill. �2007, Mickey Charles Mantle Marital Trust II and Mantle IP Holdings, Inc. All Rights Reserved. 77 Fountain Pens and 77 Rollerballs with all pen accents in gold vermeil with the fountain pen nib in 18kt. Gold, cartridge/converter fill.